I am the Regional HR Manager for the Yorkshire and the North East region. I manage a team of four who are responsible for the day to day management of HR issues. I work closely with the regional leadership team on ensuring there is a good and effective HR service provided to the region that supports the regional strategy. I am also the senior HR contact for the R&R function nationally working with the Head of R&R on HR matters. 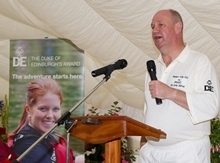 Did you talk about your DofE when you were interviewed? Not for this role as it was more based on previous experience in HR, however, I did draw on my experience of DofE in interviews in the past where I had less relevant work experience. It helped me to demonstrate skills such as teamwork, time management, tenacity, leadership etc. and also showed that there was more to me than just my A level grades and degree which, as someone who now sits on the other side of the table in interviews, is something which differentiates candidates. Teamwork, time management, relationship building, influencing. Do you think your DofE has helped shape those skills? Yes, the DofE definitely helped me to develop those skills from a young age. With the different aspects involved in each programme, it helps to develop a wide variety of skills. Getting lost in the Peak District in the pouring rain and gale force winds but then enjoying an evening on the campsite with my closest friends. Get involved in as much as you can to build your CV. There is so much competition for jobs that you really need to be able to differentiate yourself from the others. I was told this and got involved in some things but not as much as I could, particularly when I got to university. Still important to have fun though! My advice to my 16 year old self would be to get involved in as much as you can to build your CV. There is so much competition for jobs that you really need to be able to differentiate yourself from the others.